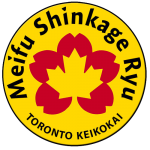 Meifu Shinkage-ryū (MSR) is a modern Japanese Martial Art. The techniques taught are part of an almost forgotten skill-set, going back to some of the warrior arts of the samurai and ninja of ancient Japan. Meifu Shinkage-ryū was created by Dr. Someya Chikatoshi in the 1950s in Japan. The school specializes in hidden, small arms (onkenjutsu), and in particular throwing nails or spikes (Bou Shurikenjutsu). The founder of Meifu Shinkage-ryū studied Tenshin Shoden Katori Shinto-ryū under Sugino Yoshio. After a few years of training, Someya-Sensei started to learn the Shurikenjutsu techniques that are part of this school. Shurikenjutsu became his passion, and through applying his experience and research, he changed the Shurikenjutsu to what is now Meifu Shinkage-ryū. In Japan, there are currently only three main schools that focuses on Shurikenjutsu: Meifu Shinkage-ryū, Shirai Ryu and Negishi ryū. Shurikenjutsu is sometimes also part of the curriculum in other weapon schools, such as in Katori Shinto-ryū. In general, even in Japan, only a limited number of budoka study Shurikenjutsu. 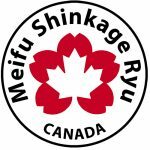 Worldwide, there are around 200 budoka studying Meifu Shinkage-ryū, and many of them also study other budo. Yasuyuki Otsuka-Sensei is the current Head Master (Soke) of Meifu Shinkage-ryû Shurikenjutsu. He has been studying throwing objects since he was young, which ultimately resulted in learning Shurikenjutsu. Otsuka-Sensei also learned karatedo and kendo. In addition to teaching Meifu Shinkage-ryû in Japan, Otsuka-Sensei teaches in official Branches and Study Groups (Keikokai) in Asia, Europe, and North and South America. His skills are recognised and highly appreciated by many Budoka in Japan as well as in other countries around the world. Besides Meifu Shinkage Ryu, Otsuka-sensei is also a skilled Origami (paper folding) master. He often combines martial art and origami in one seminar, and surprises participants with various Origami creations. During a long car ride, Otsuka-Sensei explained the meaning of Meifu Shinkage-ryû as followed. Mei 明 means bright and knowledge, as well as to understand the application of that knowledge. Fu 府 means association, such as a group of people learning together with a common goal. Shin 真 means correct or truth, in relation to Kage 影, which means shadow. Ryu 流 means school of thought, in this case: the teachings from an unbroken lineage from Someya-Sensei to Otsuka-Sensei as Soke (Head of the Family). Each element of Mei, Fu, Shin, and Kage provides balance, as bright cannot be without shadow, or as Otsuka-Sensei said: “a bottom part also needs a top-part, as each cannot exist by itself”. The Honbu (Head Quarters) is located in Chiba, Japan. 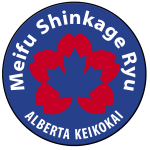 Outside Japan, Meifu Shinkage Ryu is actively practiced in official Branches and Keikokai in Europe, Asia, and North America. Branches and Keikokai are officially authorized by Otsuka-Sensei, who appoints a Chief or a leader. Branch Chiefs have been active for at least two years and have the rank of Shodan or higher. Keikokai leaders are working towards their shodan level before they may transform into a Branch. 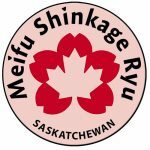 Meifu Shinkage Ryu Saskatchewan was formed in December 2014, and received authorisation from Otsuka-sensei starting January 2015.